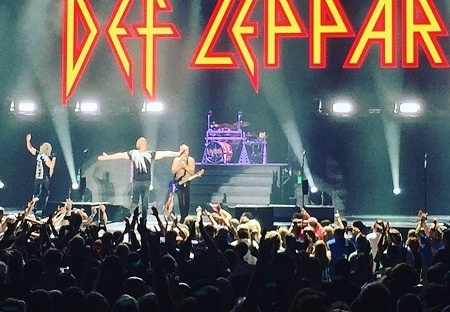 Def Leppard played a 2016 Summer Tour show last night in Atlanta, GA with 17 songs performed. The show took place at the 19,000 capacity Lakewood Amphitheatre. The band's first time in Atlanta since 28th June 2015 on the 2015 world tour. The 22nd show the band have played in Atlanta and ninth time at this venue. The first visit here took place in July 1980 in nearby Braselton as support to Ted Nugent at the Georgia jam event. They returned in 1981 to play the Fox theatre with Ozzy Osbourne. The March 1983 show as support to Billy Squier was the first US show of the Pyromania tour and the first on American soil with Phil Collen as a member of the band. Four In The Round shows at the Omni Arena followed on the 1987/1988 Hysteria tour. The first one taking place in December 1987 - their first as headliners in the city. The three nights played at the same venue in October 1988 coincided with 'Love Bites' reaching Number One and all shows were used to shoot extra footage for the 'In The Round-In Your Face' concert film. A fifth In The Round show was played during the Adrenalize tour in November 1992 followed by a first visit to Lakewood Amphitheatre in September 1993. They would return to the same venue in August 1996 when they also played a small acoustic club show which raised funds for the Georgia Special Olympics. The next two visits in 2003 and 2005 took place at the Music Midtown Festival. A show at the smaller Chastain Park Amphitheatre followed on the 2006 YEAH! tour. The shows since then in 2007, 2009, 2011, 2014, 2015 and last night have all taken place at Lakewood Amphitheatre. The 2015 show was Vivian's first show back after missing the first four dates of the US tour. Thankfully, due to his current treatment, he has not missed a show since then. The same setlist was played once again with no changes. "Atlanta. Thanks for having us. Thanks for coming. Thanks for being here. We'll see you next time. Goodnight." "Amazing. Thank you. Seriously this has been one hell of a night. Thank you so much. Until next time. And there will be a next time!. Do us a favour yeah. Don't forget us and we won't forget you. Goodnight!." The next show takes place on 13th August in Raleigh, NC. Played for the first time in Atlanta.